So this will probably be the most boring One Room Challenge update in history. Aesthetically, nothing much has happened to the room. But, we cleaned it out and began organizing the closet. It felt SO good to purge and put things where they belong, instead of tossing them in a pile and slamming the door shut before the pile escapes. Lol. It doesn't seem like we've made a lot of progress, but when I look at the empty space in the closet, it helps ease my ORC jitters. We had hoped to hang the drapes, but they were full of wrinkles (not surprising, given that they were at the bottom of the giant closet pile), so we will hang them as soon as possible, hopefully this weekend. I also realized that we need to switch out one of the nightstands as there is too big of a height difference between the two we currently have in the room, so we may have to steal a table from elsewhere in the house (or hope for a lucky estate sale find?). This will also hopefully happen this weekend, although my husband does not get as excited about moving furniture all over the house as I do. And since a narrow flight of basement stairs is part of the obstacle, I don't think I'll be moving anything by myself. 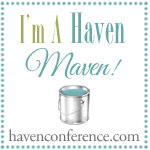 Be sure to check out my fellow participants here. And thanks as always to Linda from Calling It Home for hosting! Welcome back to week 2 of the One Room Challenge! A quick synopsis - we are participating in the Calling It Home blog challenge, and updating our guest bedroom in just under 6 weeks. This week, I am presenting my design plan for our windowless basement guest room. To be upfront with y'all, the only way my husband (aka my electrician, carpenter, and sometimes plumber) and I could fathom being a part of this round's ORC was if we agreed to tackle the room that would take the least amount of effort, time, and money. So, the majority of the room's elements are things we already have, and we are repurposing them (aka stealing) from other rooms in our home. Sometimes hoarding collecting pillows, lamps, etc. can come in handy. We've also made zero progress on the room this week; we escaped to the mountains for a few days during my daughter's fall break, and it was totally worth it. I'll just have to put that much more effort into this upcoming week! As for the design of the room, I mentioned in week 1 that I was going for a Southern coastal look. We love going to the beach, and I wanted to bring the relaxation we feel during our trips to our guests. It also helps that my in-laws gifted us a painting of the coast that has been in the family for years, and I can use it to tie many of the elements together. When we researched the name on the back, we discovered that the little-known artist has actually become quite the collector's item. And while it's not worth millions (or even close), it's neat to know that it does have a history. The design brings together some of my favorites: buffalo check, toile (either classic or chinoiserie - haven't decided yet), and the color combo of creams and blues. To address the lack of lighting, both natural and overhead, I'm bringing in a lot of lamps. In addition, the room will have mirrors on two walls to bounce the lamplight. The inspiration image is a room I have loved for a long time. It was designed by Lisa Whitley for a Southern Living home in South Carolina. I especially love the painting over the bed, and the windows and drapery behind the bed. That got my wheels turning, and I realized I could give the impression of windows by hanging drapes behind our farmhouse 4 poster bed. I happen to have some P. Kaufman buffalo check drapes that did not work well in our home but I just couldn't let go of them, so they are getting a second life in this room. The other fabric in the room will most likely be either Pottery Barn's Matine toile in porcelain blue, or Lacefield Design's Pagodas Seaside. The walls are Benjamin Moore's White Dove (my go-to white). 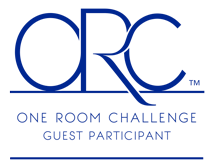 Check back next week to see our progress (or lack thereof), and be sure to visit the other participants in the One Room Challenge!